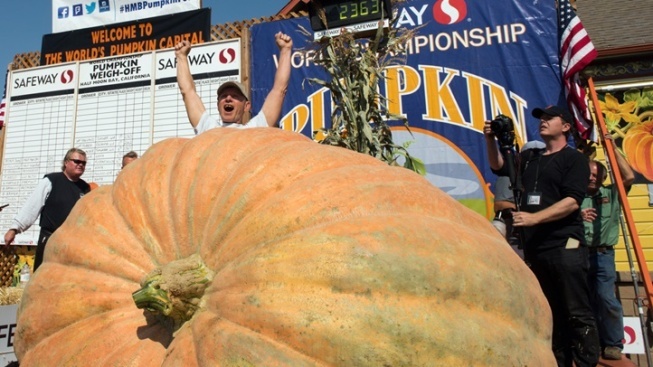 The Safeway World Championship Pumpkin Weigh-Off is back with the colossal specimens of gourd-tastic growth. A peek back at the 2017 winner: Joel Holland of Sumner, Washington had the most mondo pumpkin at the Safeway World Championship Pumpkin Weigh-Off in Half Moon Bay on Monday, Oct. 9, 2017. SAFEWAY WORLD CHAMPIONSHIP PUMPKIN WEIGH-OFF, which always occurs just days ahead of the huge Half Moon Bay Art & Pumpkin Festival. The 2018 competition, the seediest showdown around, is set for Monday, Oct. 8, and talented growers will show with their plus-plus-plus-plus pumpkins. The winner in 2017? Joel Holland of Sumner, Washington, who showed up with one magnificent stem-topper of a champion, a 2,363-pounder. The victor at the 2018 contest will go home with a lot of cash, any way you scoop it: Think $7 a pound, which, if your pumpkin weighs in at over 2,000 pounds, is a lot of dough. And a World Record Pumpkin shall net a "Mega-Prize" of thirty grand. Goodness. Talk about seed money. READY FOR A VINE TIME? Be at the I.D.E.S. Grounds in Half Moon Bay, bright/early on Monday, Oct. 8, to witness all of the impressive forklifting and squashes sitting upon super-scales. Can't make it on a Monday? The giant winner will be on display at the Pumpkin Festival on Oct. 13 and 14, 2018.